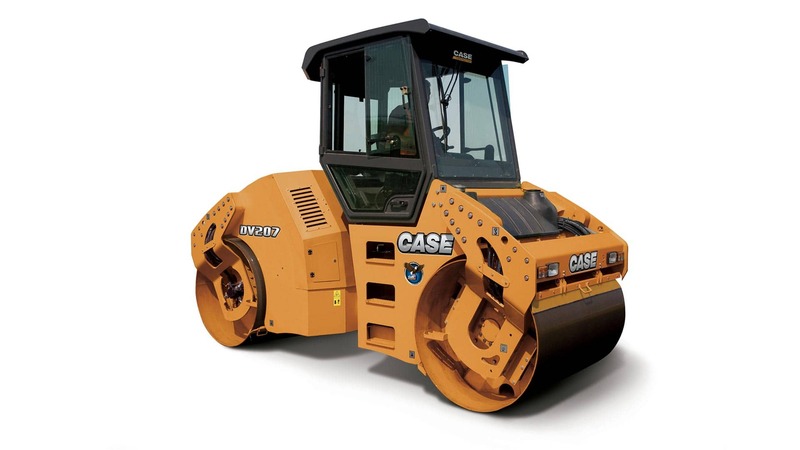 The CASE DV207 Vibratory Roller, with 80 hp (60kW), was designed to create dual amplitudes and frequencies, as well as a centrifugal force that meets the needs of any asphalt paving application. With independent drum vibration control, this machine offers the best possible compaction productivity. 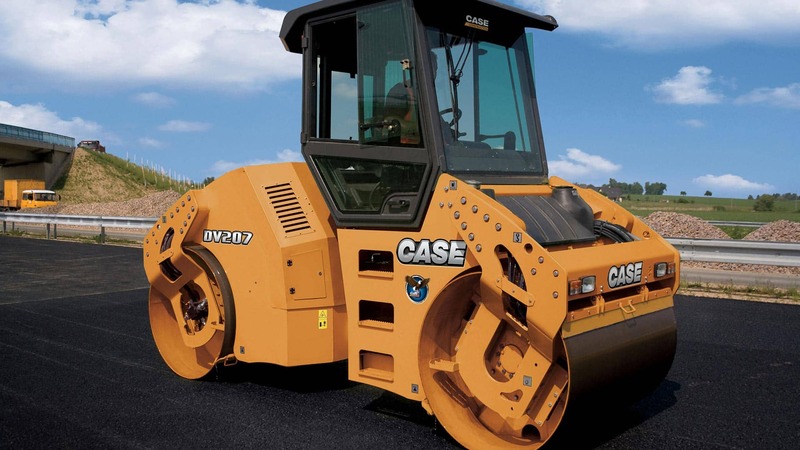 100 percent traction efficiency and zero slippage on compacted surfaces are delivered by our Case Dual Drum Drive. Productivity is maximized on coarse bases and hot-mix asphalt surfaces with high centrifugal forces and dual amplitudes. 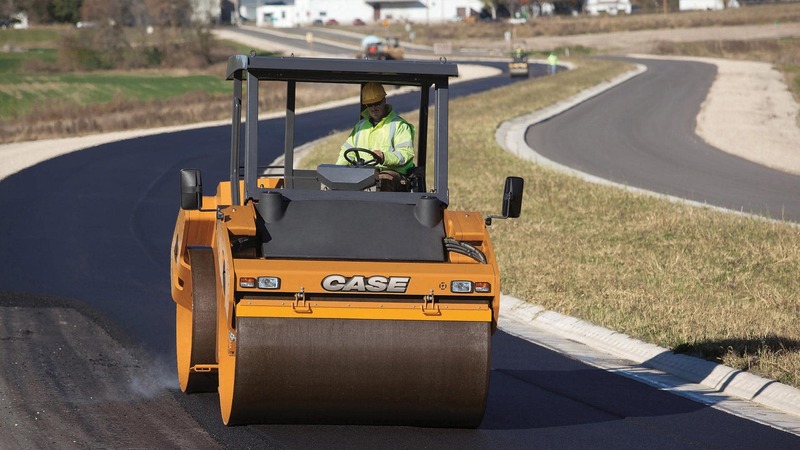 Surface damage is minimized while delivering smooth pavement due to automatic vibration control. Meet current environmental standards and consume less fuel with Tier III-certified engines. Keep comfortable even on rough surfaces with the vibration-dampening, isolation-mount work platform. Operators get a full view of the compacted surface through a multi-position station and 180 degrees of swivel seat positioning. Illumination is improved via a standard front and rear-facing halogen light. Daily maintenance and diagnostics can be done quickly and easily through a one piece vertical lift hood and ground-level access to various service checkpoints. Fixed ROPS Open Platform with hand rails. Halogen worklights x 4 (55 watt / front and rear). Turn signal indicator (left and right). Hydrostatic drive for both drums. Auto vibration stop switch in neutral. Retractable seat belt - 2 in (51 mm). Lateral shifting suspension seat with foldable arms. Water filtration - 3 stage. Lift and tie down provision – 4-point. Spin-on fuel, engine oil and hydraulic filters. Indicator lights: Battery, engine oil pressure, intake preheater, engine temperature, parking brake, vibration ON/OFF, sprinkler system ON/OFF. High frequency vibration (48Hz – 62Hz). Front and rear work lights (ROPS or cab mounted). Cab with heat and air conditioning. Radio ready (no radio/two speakers and antenna). Request a quote for the form and the commercial team will contact you to better serve you. Access our brochures and learn the detailed features of each CASE model.